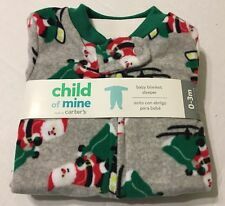 Child of Mine by carters fleece sleeper Size: 3-6 months Condition: Very good Color: gray, green, red Fabric content: polyester My items come from a smoke free household, we do have a dog. Our clothing is always washed in Tide or Persil and line-dried. Items ship next business day! Get it FAST! The gray sleeper has a Santa and penguin print. Shoulder to end of toes length is 23". Shoulder to end of toes length is 23". Baby Sleeper Blanket. Santa Print. Size 0-3 Months. UT Tee Shirt University Of Kentucky Size 3T Pink USD 10.99. Buy it now. Baby Sleeper Blanket. Size Newborn. Santa Print. Lot 100 Clothes Hangers Dress Tank Top Plastic Kids White NEW USD 39.99. New Tennessee Volunteers Laundry Tote Orange White USD 5.99. UT Tee Shirt University Of Kentucky Size 3T Pink USD 10.99. 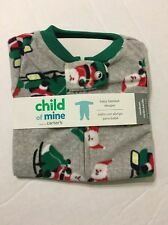 Carters Child of Mine One Piece Sleeper Jumpsuit Brand new in manufacturer's retail packaging Product Features: - Contains: - One (1) Sleeper Jumpsuit - Size; 12 Months - 100% Polyester Flannel - Suitable for Height 28.5-30.5 Inches - 20.5-24.5 Pounds. VGUC for slight wash wear. Super cute and comfy. 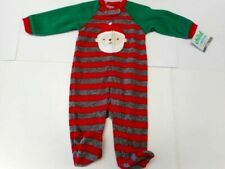 ~~SANTA CLAUS ONE PIECE PAJAMAS SLEEPWEAR~~. CHILD OF MINE. Girls / Boys Size 12 months. 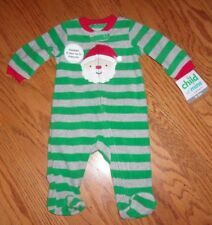 Child Of Mine Santa Christmas Footed Pajamas 24M. Condition is Pre-owned. Smoke free home. Precious fleece sleep sack with ducks on it. We only used maybe once or twice. Baby boys clothes, Boys sleepwear, One piece romper, long sleeves, open straight leg. snap closure for easy on/off, Gray Bear, 100% Polyester. Baby pajamas, Baby sleepwear, Pajamas. FOR SALE IS A ONE PIECE PAJAMA IN EXCELLENT NEW CONDITION. SIZE 0-3 MOS. CHILD OF MINE. THE ITEM IS AS PRESENTED, LISTED AND DESCRIBED TO THE BEST OF MY ABILITY. This item is in great condition. There is normal wear from being washed. All of my items are freshly laundered and come from a smoke free home. I do combine shipping. Combined shipping is based on total package weight. I will always choose the least expensive option for you. Per Ebay's terms if there is a promotion ongoing, combined shipping is not automatically calculated. I will refund any excess shipping charges as necessary. Please communicate with me about your intentions, as I don't want to send you payment reminders or file an unpaid case unnecessarily. Let me know when you have completed your shopping and I will send you an invoice with the correct shipping charges. Thank you for your interest! 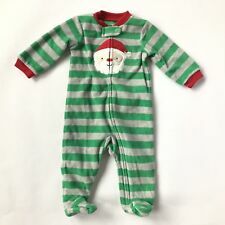 Green background with Santa Claus print one-piece footed fleece pajamas. Excellent condition. 100 % soft polyester fleece. Size newborn. Super soft fleece material. Perfect for baby’s 1st Christmas! It is a Size 6-9 Months. Fits 26.5-28.5" and 16.5-20.5 lbs. Color is dark pink with light pink polka dots. Has a white mouse embroidered on the front. Is a fleece material. Infant Sleeper. Size 6-9 Months. PINK VELOR MY 1ST CHRISTMAS. CHILD OF MINE. WITH SANTA FACE FEET. Let us know if we can do anything to improve our service. GREY WITH FOXES. 1-PIECE SLEEPER. 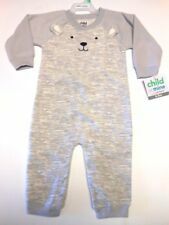 THIS IS (1) CHILD OF MINE SLEEPER NEW.THIS IS A GREAT DEAL FOR THIS ITEM.